It has now been months since Daniel Cormier defended his UFC heavyweight belt against Derrick Lewis. Cormier’s plan for that fight was pretty clear: fight Brock Lesnar for one last massive pay-day then retire on his 40th birthday on March 24. Due to multiple nagging injuries, the second part of that plan never came to fruition. Now, it looks like the first part is in serious jeopardy as well. Speaking at a UFC 236 news conference, UFC president Dana White poured some serious cold water on the possibility of Cormier fighting Lesnar. White’s comments contradict a report earlier this week that a Cormier-Lesnar fight was being targeted for UFC 241 in August. Considering that Lesnar was eligible to return to the UFC from his suspension in January and Cormier has been pushing for the fight for months, this probably isn’t a good sign we’ll be getting the fight. As recently as this week, Cormier had been publicly pushing White to book the Lesnar fight. The stage seemed set for Lesnar to return to the UFC with his loss to Seth Rollins at Wrestlemania 35, which could have freed him to take some time off from the WWE. It has been nearly three years since Lesnar’s last UFC fight, a win over Mark Hunt that was later turned into a no-contest after he tested positive for clomiphene. Lesnar hasn’t officially won a UFC fight since 2010. Despite that, there’s still very much a market for Lesnar, and Cormier seems well aware of that. He has publicly challenged Lesnar to come back to the Octagon and seems set on the crossover star as his next, and possibly final, opponent. Could Stipe Miocic get another shot at Daniel Cormier? 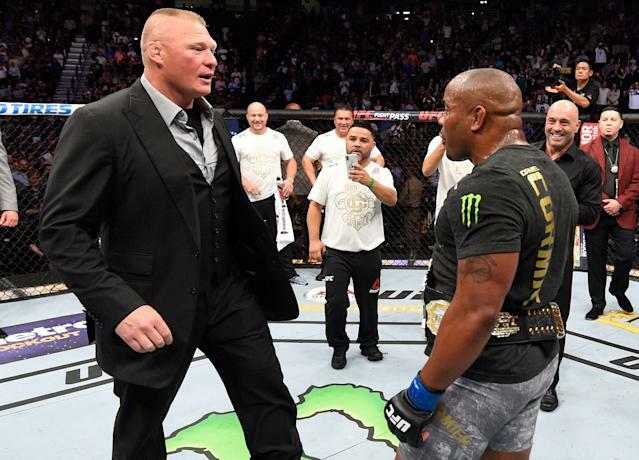 While Cormier might not get what he wanted with Lesnar, White’s comments are good news for former UFC heavyweight champ Stipe Miocic, who lost his belt to Cormier in July 2018. Miocic, who has not taken a fight since his first-round KO loss to Cormier, has publicly demanded a rematch. While another Cormier-Miocic fight might be more competitive, Cormier seemed to prefer Lesnar due to the much bigger payday and possibility of ending his career with a relatively easy win. However, since that plan may not be working out, it might be time for Cormier to move in a different direction.